The Pacific Ocean borders the east, in a windswept stretch of blue. Mount Tapuae-o-uenuku towers in the south, and the western horizon gleams in gold, with sun-bleached high country hills. In between, on a sliver of terrace at the edge of the river, Eradus grows wines that encapsulate this extraordinary place. The Awatere Valley is an exposed and untameable landscape, forged by a fault line and swept by ocean winds. 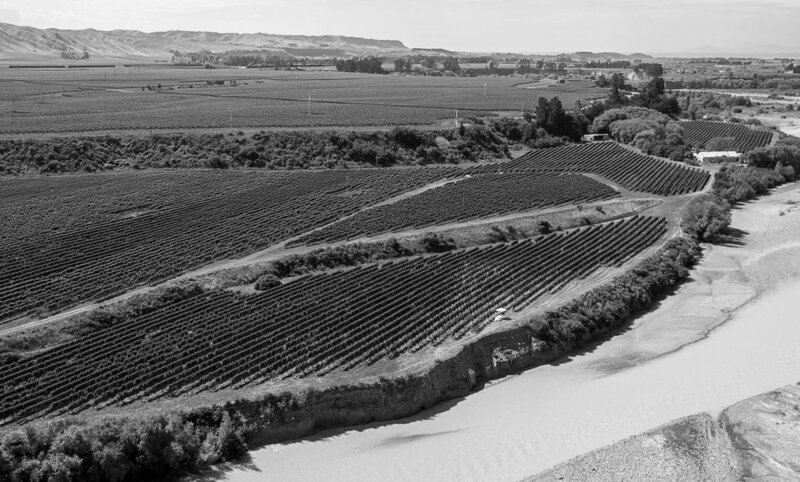 At Breloft Vineyard, a small terrace at the edge of the Awatere River, those extremes are amplified, ensuring our wines are the essence of the Awatere. Our sliver of land has its own unique mesoclimate, shaped by the line of the Alpine Fault, the course of the Awatere River, and the power of the nearby Pacific Ocean, which influences the diurnal fluctuations - warm days and cold nights - that protect the crisp acids of our wines. This is truly cool climate viticulture. Swift cool winds sweep up from the Pacific Ocean, naturally protecting our vines from disease. Harsh sun, cool winds and rocky soils ensure small berries with concentrated flavour. Our roots dig deep into a rocky terrace, four meters above the mountain-fed Awatere River, creating wines of elegance, minerality and crisp clean acidity. The nearby Pacific Ocean keeps Breloft vineyard cool and its growing season long, extending our fruit’s hang time for more intense and complex flavours.